Today was a rather ambitious! We began our morning with a level of uncertainty due to the train ticket prices to Dover. We were pleased to find a deal for 20 pounds for a round trip ticket. The rail line was rather nice and the lovely country side gave us a glimpse into suburban life. 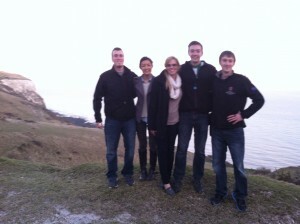 We were surprised when we arrived to see a large shipping port at the foot of the cliffs. Apparently it is the largest passenger port in all of Great Britain per our taxi driver. As we traveled down the rough terrain the port disappeared and we were left with magical vistas. We arrived at sunset which was well worth the wait. The lush green fields were a pleasant reminder that spring is a mere 4 days away! Posted in Gardens/Parks, Transportation/Infrastructure	Bookmark the permalink. Today was my favorite day of the trip! Being in London was beyond amazing, but the combination of Canterbury and Dover was somehow even more unbelievable. Two summers ago, I went to a three week-long church camp. My team leader there, Dawn, had just gotten married to a Brit then and was going to move to Canterbury after that summer. Being the British-obsessed person I am, we always went on about how great England was and how exciting it would be to live there. At the end of the summer, Dawn told me that if I ever came over, she could be my personal tour guide. I never thought I would be able to go there so soon! It was incredibly nice to be able to see a familiar face so far away from home. Dawn had changed so much! Her Jersey accent had started to transform into a hybrid British-Jersey one and her mannerisms were much more British as well. Walking down the quaint streets of Canterbury, it was pretty shocking to turn around and see her there, blending in perfectly with the locals. Dawn led us around the town, over to a hill with a wonderful view, up to the castle, and by the school she teaches at, located partially in the Canterbury Cathedral. We went to her favorite pub, a beautiful Tudor-style building with some structural issues. The food was amazing. After our meal, we went upstairs and surprisingly saw that the center of the floor was quite noticeably caving in! Later, we walked into a bookstore that was over 500 years old. It’s hard to imagine how many structural improvements it must have needed over time. We bought some intriguing looking vintage books from the early and middle 1900s. Later we went to Dover before meeting again with Dawn and her husband, Daniel, for dinner. The white cliffs were extraordinarily stunning. They were so naturally beautiful. The white cliffs were almost completely vertical, contrasting with the horizontal black ocean rocks. We went around sunset, so there was a lovely purple tinge to everything. The horizon line was covered in mist, erasing the separation between the ocean and the sky. There was a seamless transition between the two. It looked as if the ocean led off into some other world. This was definitely one of the most gorgeous sights I have ever seen before. Such an amazing day with great company. The Cliffs of Dover were without a doubt one of the most incredible things that I saw during the trip. A cliff may not sound to exciting to most but the contrast between the bleach white chalk stone, the green of the pastures, and the blue of the ocean made this sight breathtaking. We were fortunate to be able to see the sunset which amplified the views and made for an evening that I will never forget! I couldn’t agree more with you both. The trip to dover was, at first a little stressful, but then completely worth the struggle. Canterbury must be a constant filming ground for historical movies or movies of a stereotypical England. London is such a massive city that it’s difficult to get around in it. Canterbury, on the other hand, was small enough to explore much of it, but large enough to still get lost. Although a full day or two would have been much more convenient, I would say we made the most out of our day. Dover was even more beautiful and amazing than people say it is, and that certainly says a lot about it. The only other time in my life where a place was overwhelmingly more spectacular than the already amazing descriptions of it were was machu picchu. 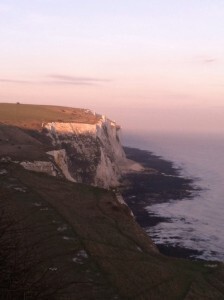 Comparing dover to one of the most breathtaking places on earth says worlds about the immense beauty it held. I envy the people who went on evening runs along the cliffs. The moment was pure.